So I've found that a few movies have the wrong Title. 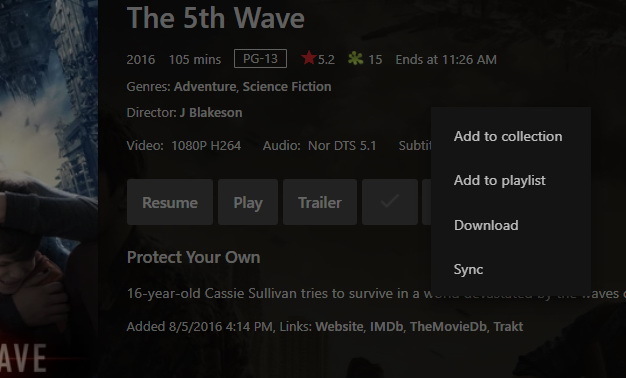 For example, I have "5th Wave" and "The Wave", both movies display as "5th Wave" incorrectly. How to do I change the metadata for the incorrectly labelled movie? Also this has happened for "Animal Kingdom" TV show, where the first pile of episodes have the wrong titles and descriptors as they are incorrectly being labelled from the nature show "Animal Kingdom" not the the drama series. Thanks! Hi there, have you tried the Identify feature? No sorry what is that? In the web app open the movie detail screen, click the 3-dot menu, then click Identify. You can use the Identify tool to match it to internet metadata. It is only available for emby admin users.